Peter Finch from Quest Golf Academy recently completed the FlightScope Combine Assessment available on the FlightScope Skills app. The FlightScope Combine is designed to be the ultimate test of a golfer's skill level by allowing them to use simulated targets on the driving range during practice. 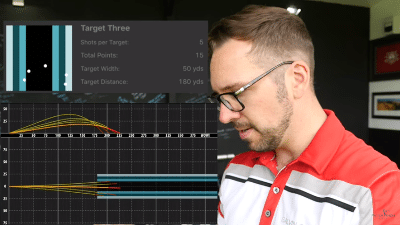 The targets are also fully customizable, giving golfers the ability to choose the size of the target, the distance they want to hit, and how many points each target is worth. The Skills app then calculates a score depending on the accuracy of the shots. As Peter Finch says, the Combine challenge is key in allowing a player to practice with a purpose and allowing them to fully engage in the practice session. Hitting multiple balls at the same target lets a player work on their swing change by seeing shots with multiple golf clubs. The FlightScope Combine test gives golfers a tool to better understand where they want to go and how they need to get there. Do you think you have what it takes to make it to the top of the leaderboard? View the FlightScope Quick Combine leaderboard here.Take on the challenge on MyFlightScope.com now.